Following the great success of its first Extreme Tourbillon Regulator Manufacture – the Full Black version – at Baselworld in 2009, ALPINA Genève is proud to present two new models in gold, both issued in an extremely limited series of just 18 numbered pieces. These new versions, both as astonishing as the first, feature a “Full Black” dial and a caliber consisting of 188 parts, equipped with a Silicium Escapement Wheel and the latest development: a Silicium lever. After three years of Research and Development, the experts at ALPINA Genève, Swiss manufacturer of high quality sports watches, were ready to present the brand new, inhouse automatic Manufacture Tourbillon Regulator movement. A team of specialist designers, engineers and watchmakers worked hand-in-hand to revive ALPINA as a true Manufacture. Supported by the latest in high-precision equipment and driven by a passion for innovation. conceived within its workshops in Plan-les-Ouates, Geneva. A unique movement that presents several specific, innovative features: Silicium Escapement Wheel and Silicium lever, Smart Weight Balancing™, fast oscillation at 28’800 BpH and an individually numbered Tourbillon cage. 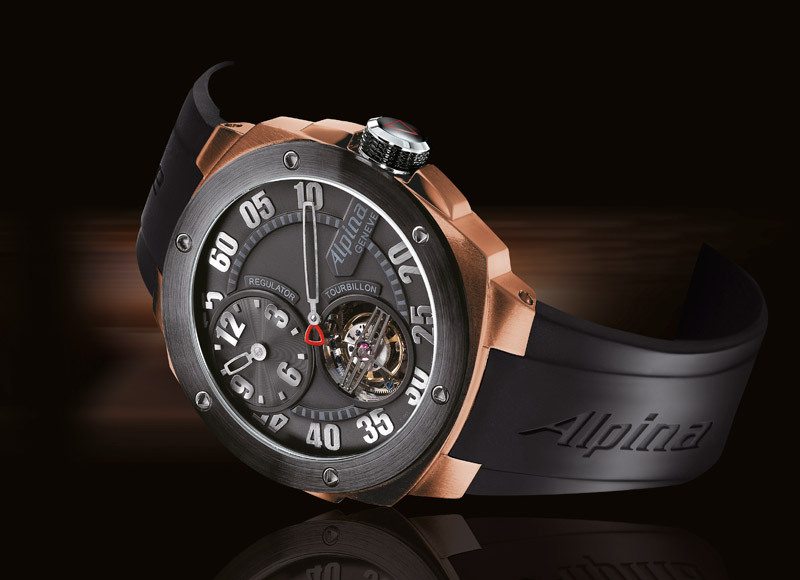 The specific and technical designs of these new Extreme Tourbillon Regulator Manufacture models capitalize on the strong brand philosophy of ALPINA: highest level of accuracy, extremely high readability, shock resistance, sturdiness and reliability. The timepiece, with a bold case diameter of 48 mm, is crafted from either titanium with a pink gold bezel, or pink gold with a black ceramic bezel. The matt black dial features finely brushed steel ALPINA Double-Digit indexes. 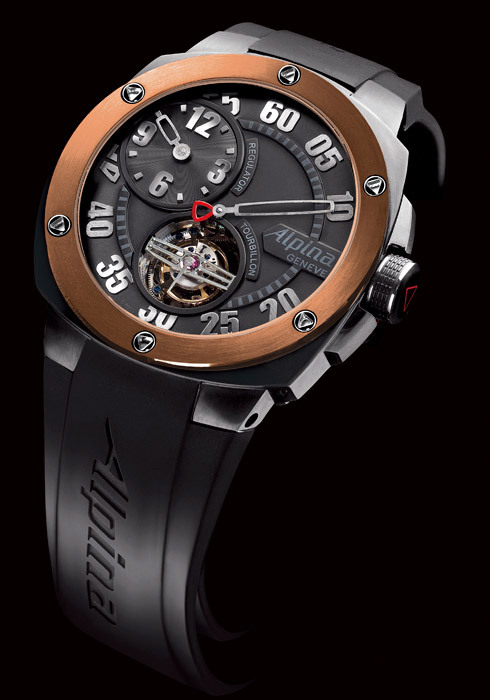 The iconic ‘Extreme’ design elements remain, and have been coupled with a more elaborate dial design: satin-brushed touches of black in the center of the “Regulator” sub-dial, skeletonized hands in black brushed steel, unique and originally decorated bridges in the Tourbillon cage and a black PVD signature ALPINA oscillating weight, visible through the sapphire crystal case back.